Hi and Welcome to Mins Karaoke Lounge and Shot Bar in TUMON. We opened in April 2010 for Locals, Military, & Tourists – who are looking for a clean luxurious Karaoke Lounge to sing with Family and Friends. Bring your own partner, because Min’s is NOT a host/hostess bar. We are located right across from the Tumon Police Koban and a walking distance from major Hotels in Tumon including Hyatt, Outrigger Hotel, Westin Hotel, and Marriot to name a few. If you need a ride, it is inexpensive. Call for details for transportation or information. If you don’t sing, you can still enjoy our friendly environment. Enjoy playing Billiards, Pool, or a game of Darts. Cold Drinks, Assorted Cocktails, and Fun!!! All kinds of Beer: from Budweiser, Miller Family, Heinekin, Asahi, Kirin, Beer Beer!!! Transportation: Hotel Pick Up and Drop Off available upon request. Service Charge Applies. Call for Rates. We accept Group Bookings and/or Party Bookings. Come on down and have some karaoke fun. 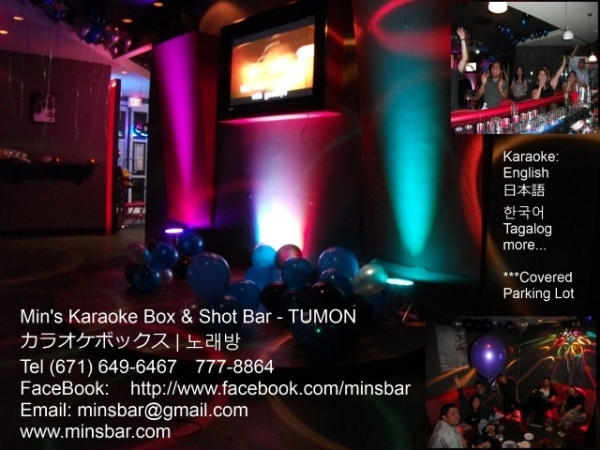 Mins Bar is the only one: ‘Classy’ and ‘Luxury’ Karaoke bar located in Tumon Guam. We have a well balanced classy and joyful atmosphere where you can be singing, dancing and drinking with your friends! It is the perfect place in Tumon for a private function, meetings or corporate functions, featuring a range of food menus to fit any budget. Located in the heart of Tumon Guam, or ‘Hotel Road’ as it is colloquially known, Mins Karaoke Club will make a Rock Star out of you and your friends. Mins Karaoke Club has more than 10,000 of your favorite karaoke songs to sing from in English, Korean Songs, Chinese Songs or Japanese Karaoke Songs. We also have Tagalog Karaoke Songs, Vietnamese Karaoke Songs, Russian Karaoke Songs. Open Mic Karaoke & Private rooms which can accommodate small groups which can handle 10 to 15 of your most extroverted friends. Think of us for a memorable night out or for any private party you are looking to host. The Main Room can accommodate 75 Pax. Best karaoke sound system. I am a singer by trade so I know an awesome surround system when I hear it. Great sound system! I like that it’s clean and has open mic karaoke. I enjoyed Min’s Asahi Bomb. It was fun being there at Min’s. The place is clean and spacious. I’m a bit claustrophobic, so that’s a big thing for me. I also like that I can enjoy playing billiards. Awesome Karaoke Sound System and lots of room. My friend just celebrated his Birthday at Mins with a karaoke party after dinner. Mins was the right choice. Clean and High Class! Min’s is my favorite karaoke bar so far!